Cacharel launched its first perfume in 1978. It was called Anais Anais which was a huge success. It was noted for its expression of femininity. It was followed by many more successful perfumes. Even after 30 years in the fragrance industry, Cacharel stands out for its unique perfumes. Anais Anais is an ultra-feminine, fresh and romantic perfume with scents of a bouquet of flowers. The fragrance opens with orange blossom and hyacinth with heart notes of rose, lily and jasmine. The base notes are amber, sandalwood and a mysterious touch of incense. Though this perfume was created in a different era it still represents a modern-day woman. Cacharel Pour Homme for Men was launched in 1981. This was a very popular fragrance in the 80s and still continues to be a favorite among men and their ladies. It has a woody aromatic composition. The top notes are bergamot, sage, nutmeg and lavender with middle notes of ylang-ylang, lotus, geranium and carnation. It has a warm base of amber, cedar, vetiver and fir. LouLou was another top selling perfume of the 80s. It is a bold, powerful, distinguishing and timeless fragrance. LouLou is a kind of perfume which you either love or hate, but definitely can not ignore. It is impossible to resist this fragrance. The top notes are composed of violet, plum, black currant, marigold and anis. The heart notes are Tiare flower, tuberose, ylang-ylang and orange blossom with base notes of Tonka bean, orris, vanilla and balsam. LouLou has an equally intriguing bottle. It is opaque blue and red flacon in a simple octagonal straight line shape that tapers at the top. This fragrance was launched almost 20 years ago and is still successfully selling. Perfume lovers absolutely adore this fragrance. Cacharel launched another mind-blowing fragrance called Noa in 1998. This fragrance for women has delicate, velvety, fruity nuances. Its top notes are freesia, peach skin, peony and musk with heart notes of white flowers, ylang-ylang and rose. The base is woodsy transparent with coffee and incense touches. This is one of the ageless fragrances which could be worn by anyone; from a 16 year old girl to a mature elegant woman. Some of the recent fragrances from Cacharel include Amor Amor, Tentation, Amor Pour Homme Tentation which was launched in 2008. Amor Amor Sunrise was launched in 2009. The most recent Amor Amor edition called Amor Amor Sunrise is juicy, refreshing and fruity like a summer cocktail in a glass by the pool. The fruity ingredients include raspberry sorbet, grapefruit and pineapple. It has an equally cool flacon which is white decorated with a pink-orange flower. Cacharel clothing line is know for its seamless fusion of traditional and modern influences. The exact same influence is also seen in its perfume lines. 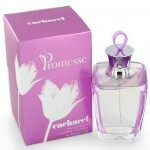 Cacharel perfumes are light, sensual, refine and delicate. All these exception qualities have contributed to the success of Cacharel line of perfumes.